It is with great sadness that I create this page in Loving Memory of Tim Brown. Tim passed away on February 10, 2017.
to keep the Decker Rat Terrier still in existence. Everyone in the world of Deckers knows the name Tim Brown. He will be highly missed by all that knew him. 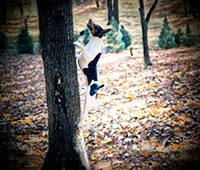 Please click this link to see His story and photos about the Decker Rat Terrier.